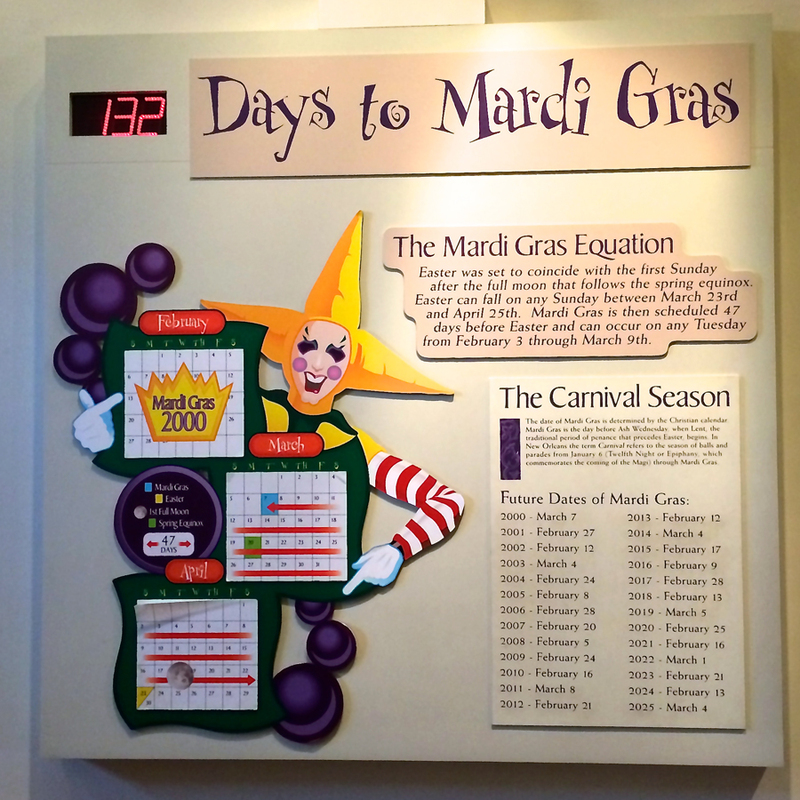 For those who prefer quiet to over-the-top Mardi Gras celebrations, fall is the perfect time to visit New Orleans: the worst of the heat is over, restaurant reservations are fairly easy to get and the streets are passable, perhaps with the exception of Bourbon Street at night. I recently spent 5 days in New Orleans. My home away from home was Hotel Mazarin, a lovely French Quarter boutique hotel on Bienville Street, half a block away from Bourbon Street. I highly recommend it for its central location, well-appointed and spacious rooms and common spaces, friendly staff and extensive breakfast spread. In a Now Smell This Lazy Weekend Poll, I asked for New Orleans perfumery recommendations and someone mentioned Hove Parfumeur. The boutique is surprisingly boudoir-like despite the dark wood furnishings and stone floors. Hove carries its own line of fragrances; these are available in different formats and concentrations (perfume, cologne, solid) and can be added to lotion, shower gel and body oil. Some of the perfumes have a matching soap, candle and room spray. There are over 50 different fragrances split between the Standard Line and Luxury Line. This bifurcation did not make a difference to me other than the Luxury Line is a little bit more expensive than the Standard Line. So how does one smell through 50 fragrances in one visit? 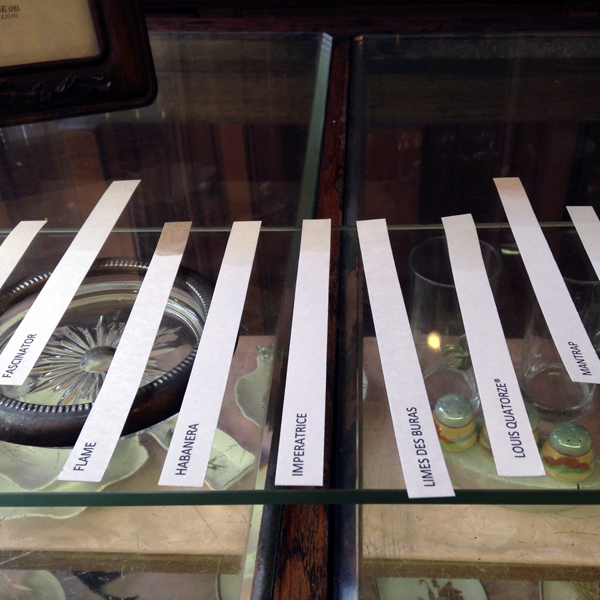 On top of the counter, pre-dipped tester strips marked with the perfume names are laid out on top of a sheet of glass. As you cycle through the perfumes, push forward the strips you are interested in. The staff will then pull out the perfume bottles from the cabinets on the back wall and give you an opportunity to get up close and personal with the perfumes. Most of the perfumes had a classic feel and I had a difficult time narrowing them down but narrow down I did. I ended up with a shower gel fragranced with Corduroy, a travel atomizer of Mantrap, ½ dram each of Heliotrope, Spring Fiesta and Fascinator, plus a bunch of soaps (yes, I have a soap obsession). Bourbon French Parfums was a serendipitous find. At the library, I came across Dollbaby (by Laura McNeal), a fictional coming-of-age book set in 1960s New Orleans. Normally, I would dive right into Chapter One but this time, I decided to read the Foreword. Lo and behold, the author mentioned that the perfumery in the book is based on a real perfumery that had since moved to Royal Street. 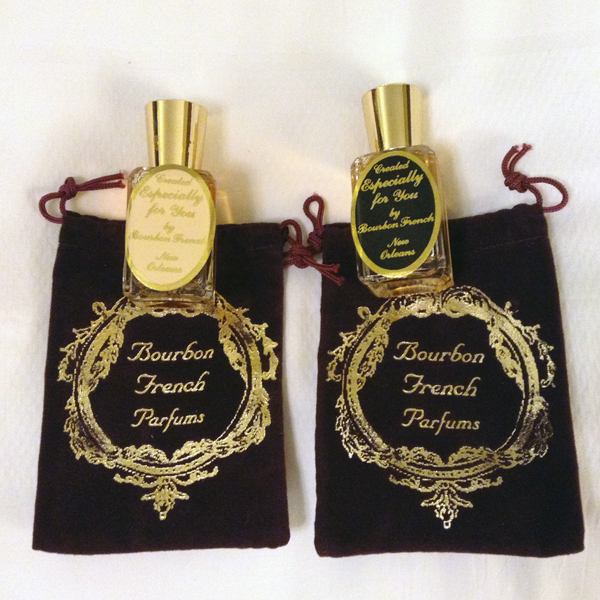 You can just imagine my excitement when I found out that Bourbon French Parfums has a custom-blend perfume service! Bourbon French Parfums is located on Royal Street, a 13-block stretch of fine jewelry stores, antique shops and boutiques, art galleries and restaurants. Upon walking into the nondescript storefront, there’s an eclectic mix of colorful perfume bottles and atomizers, counter tops and shelves full of perfume and perfumed body products. Similar to Hove, Bourbon French carries house perfumes (Parfums de Maison), soliflors and blends with names like Voodoo Love, Kus Kus and Quadroon. I was lucky enough to have the opportunity to consult with custom-blend specialist Jasmine. The custom-blend perfume corner has several trays of dropper bottles, consisting of what looks like about 100 different essences. After asking me questions about my scent preferences, she smeared 3 essences on my forearm: spicy, sweet and powdery. We went through 4 mods over 40 minutes until I got my scent. Although the minimum size of a custom blend is 1 oz., I was able to get two ½ oz. bottles since the 4th mod is different due to the addition of fig to mod 3 to brighten it. My custom-blend included: white tea, lily-of-the-valley (those who know me are probably gasping right now), tuberose, vanilla, musk, black cherry, sandalwood, amber tobacco, patchouli and citrus. I asked Jasmine for tips for others who may visit and utilize the custom-blend service. She strongly suggests making an appointment and don’t wear perfumed lotion the day of the appointment. The store closes daily at 5PM so make sure you allow time for your visit even if you are not going to get a custom-blend. 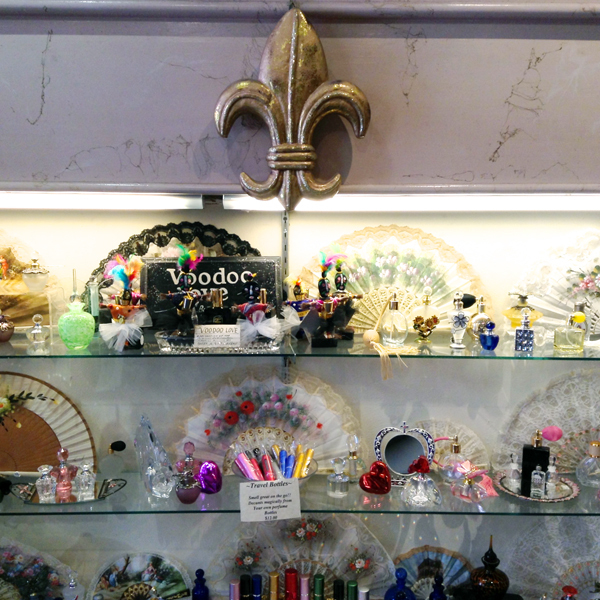 Forever New Orleans (301 Royal St.) – Would you believe this store does not have a web-shop? In addition to New Orleans themed merchandise, the store also carries the Royal Apothic line of perfumes, hand creams and candles. I bought a travel spray of Royal Apothic Plains of Thistle in a beautiful green bottle and package. Do read Undina’s post on “minor brands” to see which Royal Apothic perfume she recently bought. Dollz & Dames (216 Decatur St.) – This is a women’s wear and accessories boutique. It carries two lines of perfume: Juliette Has a Gun and Alice & Peter. Not many stores carry these brands so this is an opportunity to spritz and test instead of buying samples. 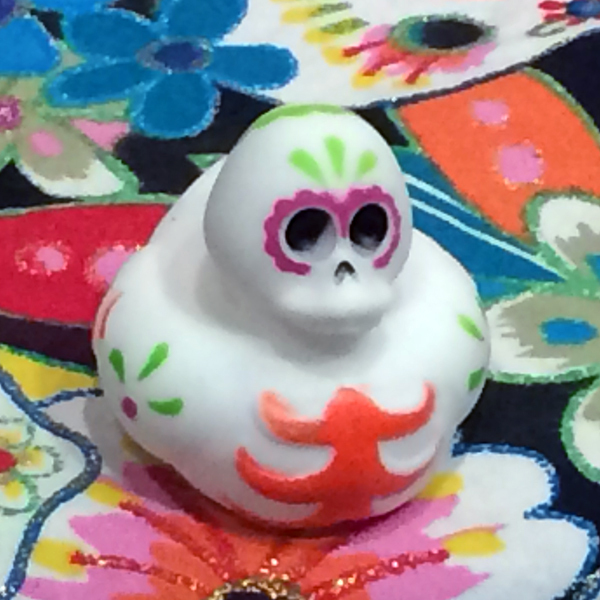 Marie Laveau’s House of Voodoo (739 Bourbon St.) – While searching for Day of the Dead rubber duckies (don’t ask), I walked into this shop and the counter-top had perfumes for sale – Magnolia, Sandalwood, Musk, Vanilla, Patchouli and Jasmine. The shop was really crowded and I was very uncomfortable inside and left without buying anything. As someone who cannot stand hot & spicy foods, I was concerned about not being able to enjoy the New Orleans Cajun and Creole foodie scene. And boy, was I wrong! Cajun is country-style food, a combination of French and Southern cuisines, with the most common dishes being jambalaya and crawfish etouffee, both served over rice. Creole food is a refined combination of European and African cuisines with rich sauces, herbs and more extensive use of seafood. While I ultimately stayed away from Cajun food, I had my share of Creole food, including lots of gumbo. There is no shortage of restaurants in the French Quarter. I particularly enjoyed dinner at Red Fish Grill (115 Bourbon St.) and Olivier’s (204 Decatur St.). 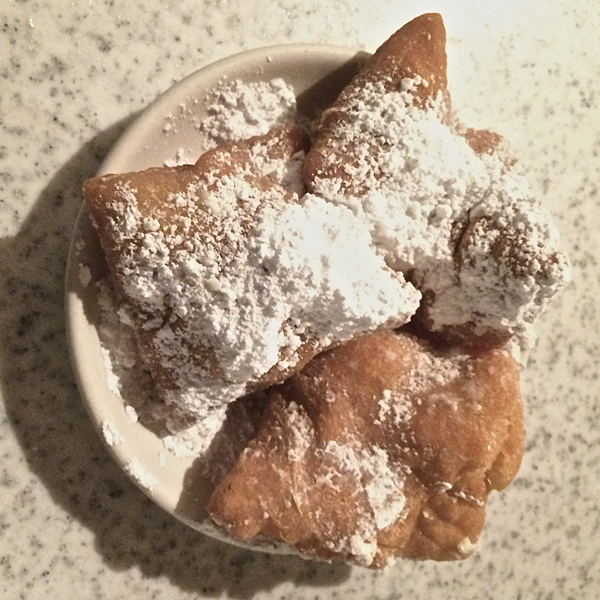 On the sweeter side, a visit to New Orleans is not complete without a visit to Café du Monde (800 Decatur St.) and enjoying a plate of powdered-sugar coated beignets while sipping aromatic chicory café au lait. Tip: Don’t wait to be seated. Look for an open table, sit down, and the server assigned to your section will stop by to get your order. Also, if you are planning to visit Café du Monde’s store, it is across the street from the Café and it closes at 5. I hope you enjoyed reading about my perfume shopping, with a side helping of eating in New Orleans. I went to many more places worth visiting – the Louisiana State Museum at The Cabildo and at The Presbytere, the Ogden Museum of Southern Art and the World War II Museum, among others. I also had a chance to tour the Lower 9th Ward, the area devastated by Hurricane Katrina. Almost 10 years later, the area is still a ghost town with empty lots, perhaps every 10th house raised or rebuilt, but there are still no businesses (grocery stores, banks, gasoline stations) in the vicinity. It’s an infamous Black Friday in a couple of days. For Undina’s monthly statistics post please tell: 1) in which country do you live? and 2) have you ever done any Black Friday or Cyber Monday perfume shopping (with Internet there are no borders for a good deal, are there)? You will be entered into the draw for 2 ml of hajusuuri’s custom blend perfume and a block of Pumpkin Spice soap. The draw is open until 11:59 PM PST on (Cyber) Monday, December 1st. The randomly selected winner will be announced in the next statistics post.